You have to be strategic to make the most of doctor visits — especially when you’re dealing with Lewy Body Dementia (LBD). We have been made to wait many hours, been rushed, had disinterested and tired specialists, witnessed brutal humiliation, been ignored and more. This has led to significant changes in how we engage during appointments. Employing a strategic approach has improved the experience and outcome of appointments. Doctors and specialists are always in a rush. A legitimate rush usually. There are too many patients and too many complications, and they rarely have enough time to focus on the complexities of a condition like Dementia with Lewy Bodies, especially if the person is ailing and has other complex conditions that may interact with LBD. What can you do to diminish the impact of dementia when you get the rare opportunity to meet with a specialist in person? Lots. Pre-Appointment Considerations. A Few Days Before. Prepare, Prioritize, Plan and Enact Your Appointment Strategy. Get Time Alone With The Specialist So You Can Speak Frankly. Mention Any Changes in Behaviour or Cognition and Current Medications. Bring Written Details, “Evidence” and Video. Advocate Assertively. Cross Examine Your Specialist. Don’t Be Intimidated By The White Coats. Raise Issues About Yourself as Caregiver. Record The Consultation Session If Possible. Remaining Calm Yourself Gets Good Results for Everyone. I’ll go into detail below, so you can maximize your time with the specialist, and get the most out of it. Some of the benefits from the tips may become apparent in the future, in their positive feelings towards you, once they recognize you are committed, knowledgeable and respectful with the best interests of both your loved one, and the specialist at heart. Before the appointment, there are some things to consider and prepare. 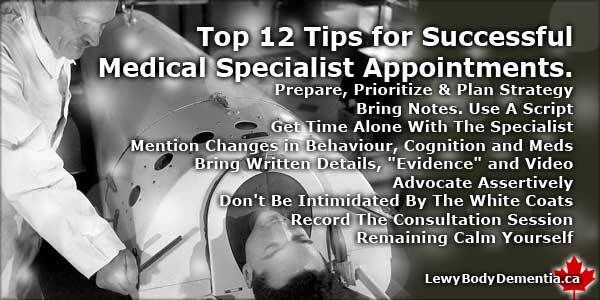 A critical one is whether to advise your loved one about the upcoming appointment. Some may react with great anxiety. They may feel, rightfully so, that they are put under a microscope and will resist going or worry for days in advance. Make your decision with respect for the individual, but I have found it best to provide no advanced notice, using a “fiblet” to explain why I “forgot” about the appointment. This is somewhat deceptive, but provides peace of mind for your loved one as long as possible, and I see that as a compassionate, appropriate decision. Some specialists may allow you to communicate with them outside appointment times. If you can send them any condition changes in advance, and issues you want to discuss, that will allow them to consider them beforehand and will make the appointment more productive. This is rare, but worth requesting. Ensure that you have any healthcare directives and Power of Attorney documents in order so that the specialist will allow you to participate. Legislation often will side with the patient, not the care partner, and if the person with LBD appears fully competent, or is able to perform unusually well during these sessions, the specialist may have to exclude you from the proceedings unless you are an already-established care partner with some degree of authority. Always do your best to make friends with the “gatekeepers.” These can be receptionists, assistants, schedulers, and junior clinicians. You will need their goodwill to book an appointment, an urgent consultation, a crisis intervention, or a referral to another specialist. Doctors and administrators often need to complete forms on your behalf, and they’re more likely to do so if you’re in their “good books.” Getting them on your side will serve you well. Some people bring treats or token gifts for everyone, but at very least, be civil and respectful with everyone. Some of this may sound mercenary, but I think it’s best to do what you can to endear yourself to them to achieve your goals, and your goals are honourable. Make friends and allies, not enemies: then everyone wins. What is the most important thing to achieve at the visit? The second and third, if time permits? Think of what was missed on previous appointments or at meetings with other specialists. Make sure you can get to all of your key points, but prioritize them so that if you only get to one or two, the most important ones are presented first. To decide how you prioritize things, consider and categorize things that are important, and things that are urgent. Those are often quite different things. Whatever is BOTH urgent and important should be higher priority for you. Have things written down in advance. Edit your priorities before the appointment so you can refresh your memory, and remove or emphasize things as needed. Since LBD fluctuates, what you thought earlier was the key issue may change over time. Without notes, you may forget something that is critical for them to know, but which has become less significant to you because of other things that are more impactful on a day to day basis. For example, they may have significantly increased agitation and anxiety, but all your attention has been focused on incontinence by necessity. Medication changes might benefit the behavioural aspects. which the specialist might be able to help with, but if you focus only on incontinence in the consultation, you will miss a big opportunity to improve behaviour. Throughout the appointment, remind yourself to actively listen. It is easy to become overwhelmed with the situation, information overload, jargon, and to be distracted, but it is critical that you listen openly, respond honestly and concisely, and avoid getting defensive to ensure your time is used most productively. Before the visit ends, review and make sure that you have covered what you need, and if you haven’t done so, take that opportunity to cover any outstanding items. You should always have notes, and review them beforehand. Don’t rely upon your memory alone, unless you are infallible. And even then, bring notes. And a way to write more during the session. Prepare a written script with your key points that you can read, if it helps. The specialist will likely appreciate that you do — they’ll see you’re prepared, and have put thought and time into making the most of their time. Reading may diminish awkwardness or intimidation you might feel as well, and the stress of dealing with Lewy may cause you to forget key elements, things that reading a prepared the script will ensure are covered. In addition, prepare what’s commonly referred to as an “elevator speech”, a concise pitch or statement that covers your most important content so that if you have only a few moments of their attention, you can get across what is most critical. A brief, poignant, and concise summary of the issues may draw their attention back, and get them to focus more on your situation. You never know how long you’ll get, so having an elevator speech ready will at least guarantee that you get the absolutely vital information aired. If your loved one wants to participate, and is still reasonably functional, ask them to prepare their own questions and bring them as well. They will often have things you have not thought of, or want to discuss things they have not raised with you. Too often, people who are only mildly affected by dementia are dismissed, and talked about, rather than addressed directly and talked to. This is not only abominably demeaning and disrespectful, but counterproductive: it robs the person of a vital opportunity to express themselves. Consider how your loved one feels at each type of appointment. Some will be fine with certain appointments, and at certain times, and feel like a frog being dissected at other times. Try to predict how they’ll feel, and make them as comfortable as possible in what is so often a very unpleasant experience for people with dementia with Lewy Bodies. One of the many humiliations in clinical settings that a person with LBD may have to endure is having things revealed to them by their care partner that they had no idea they were doing. Too often, in my view, a clinician will see the patient and the care partner in the same room, to save time or for full and equal disclosure. I think this is improper in most instances. However, most specialists will allow you to see them separately, even if only briefly. This is worth pursuing. The benefit is that, individually, you will both be able to speak freely. You won’t have to mince words, or try to let the other person “save face.” Few people are going to be comfortable saying “he has become doubly incontinent”, or “she cries about her long-dead parents every night” while the person with dementia is sitting right there. If you get separate time slots, you can be more honest, and will be doing your loved one a great service: by allowing the truth to be told fully to a person who may have the power to make changes that will make the life of the person with LBD infinitely better. This can include the changing or adding medications, giving a referral to another specialist, getting physiotherapy or occupational therapy, arranging for respite care, or connecting with hospice. In addition, this will allow the specialist to see the patient alone, without your presence. It is common for someone to finish the sentences of those they know so well, or to compensate for language or balance issues by helping automatically. This is compassionate, but not necessarily best, and may provide an unrealistic version of reality. Ask the specialist to be respectful to the patient. For any jointly-attended appointments, it is vital that the clinician understands that it is the person with LBD that should be talked to and addressed, not talked over and ignored. People with dementia can often understand a great deal more than others may perceive, and there is a downside both to their self esteem, and also to their cognition and behaviours in the post-appointment hangover period, which — in my experience — is significantly longer when the session is unpleasant or humiliating. If the session is going to be attended by both parties, if you can, sit a little behind them so you can give visual cues to the clinician without your loved one knowing — for example, if they say they walk fine all the time, you can shake your head if not, and if they say they are never incontinent, you can nod your head in affirmation. I only recommend this as a compassionately motivated deception, where the sole intent is to give the specialist the real pictured, and in no way is it intended to undermine the person with LBD. If you do get separate segments, you’ll have to ensure that your loved one is safe. It may be as simple as asking a receptionist to keep an eye on them. However, it is often best if you can bring a helper with you to engage with your loved one. That will allow you to concentrate more fully during your segment with the specialist without being distracted or rushed. Physical, cognitive or memory testing (like an MMSE or MoCA) is a common component of many appointments, and that may be a good time to meet separately with the doctor, while your loved one is in a safe, supervised environment. If you cannot get a separate appointment, you may want to bring a note to give to them in advance with your top concerns that cannot openly be discussed. If cognitive testing is to be done, you may prefer to be present, because you can assess whether they are being humiliated or if there is any point to it anymore. At a certain stage, there may be little to gain from whether a person can properly connect a series of dots, draw a clock, the hands on a clock, or overlapping shapes. It may be warranted in early and middle stages to assess decline, but at some point that loses its merit entirely. Finally, if you have your appointment as a shared session, many clinicians will start exclusively addressing the care partner instead of the person with dementia, which is a doubly humiliating experience for all, and can significantly impact the person’s sense of worth. That alone is worth going to great lengths to maintain, and having a one-on-one session may achieve that. Some people may become anxious if separated, or if they believe they are being discussed or sentenced in absentia. You will need to keep this in mind as well, and base your decisions accordingly. Mention Changes in Behaviour or Cognition and Current Medications. Pertinent items you should cover would include any changes in behaviour, cognition, memory, hallucinations, delusions, agitation, sleep patterns, energy, balance, rigidity, falls, dizziness, swallowing problems, respiratory issues, blood pressure, medical conditions such as infections, and — very importantly — medications. Keep track of when any changes occur, the frequency and duration, and what you’ve used to try to manage them so far. Keeping a log book for all this is the best method I’ve used, or keeping notes on a smart-phone or device that you can easily retrieve. Knowing the dates when any changes happened allow them to be related and compared to the current status. If certain issues arise at certain times of day, or the week, that is pertinent as well, and should be noted, if not mentioned. It may help to keep a chart or separate pages for changes categorized into sections could, for example, cover physical, cognitive, behavioural, and emotional areas. Each of these are frequently treated by different types of medications, and may help you keep things clearly organized. This system also allows you to note if there are any improvements or declines that you can relate to specific treatments. Appointments have some similarities to court trials. There’s a judge (doctor) that delivers the sentence, there’s the attorney (you, as advocate) and the defendant (the person with dementia). And as a metaphor, although flawed, many elements hold true. One to keep in mind is that you, as advocate, should always come prepared with as much evidence as you can. Be that in note form, video, audio or photo. All will be helpful. If you can bring video recordings of particular behaviours, they may be very helpful. Particularly if they are challenging, worrisome, new, or dangerous. Since people with LBD will often perform in “Showtime” mode during appointments, the specialist will likely not witness the most critical behaviours. Most smart phones now have good video and sound recording abilities, and using this capacity can be invaluable in making your case and getting the best outcomes for the person you care for. Advocate Assertively. Respectfully Cross Examine Your Specialist. Once your points have been made, respectfully engage with the specialist and ask what can be done about the changes, cross examine them. What do the changes mean? What is likely coming next that you can prepare for? Are there any medication changes or new drugs that would help? Are there any new resources in the community they know of? Is there a medical study underway that you could participate in? Can the person connect you with someone useful? Finally, ask that any changes to be done GRADUALLY, particularly with medications, to avoid problems that tend to be particularly dramatic with LBD. The request to change slowly may be resisted, but unless there is a clear and present danger to the current medication regime, the old adage about medication changes “start low, and go slow” should be respected, whether starting or ceasing a medication. Nobody likely knows as much as you about your particular situation, so be brave and assertive, you may need to reiterate your views to someone of high repute. Be persistent. Ask a question again if you don’t get an answer. Don’t be intimidated. You are doing a very, very tough job living with Lewy, and should be treated with the utmost compassion and respect. You deserve that! Any appointment is likely a very rare opportunity — so prepare for it and be confident, but be respectful, and present your case clearly and concisely to get the best outcome of the visit. It is good to remember that you likely know a great deal more about the condition than a clinician does, particularly relating to your particular incidence. Lewy Body Dementia fluctuates wildly, and presents in such disparate ways that you may present information they have never heard of. This could actually be very valuable for their own understanding and their clinical career. The specialist may also suggest things to you that you have already considered and previously rejected. At these times, remind yourself to actively, and openly listen to their suggestions, even if you initially react against them: listen with open ears. If, after hearing them out, and you have already thought something through, let them know your decision. Many LBD-related aspects can be interpreted in various ways: you know your loved one best, so you may know that you do not want to try a different medication, or to stop another one, have them sent somewhere for needless testing, or perform heroic measures if you’ve already thoughtfully decided against them. You are the committed advocate of a person, working in their best interests, and that gives you the authority to proceed as you see fit, and disagree as you see fit. Caregiving is a vampire for energies, emotions and health. It can also be liberating and life affirming, but the downsides need to be monitored and their negative effects dealt with effectively and honestly. Mention any problems you, yourself, are having. These could include sleep problems, depression, anxiety, health issues, challenges in the care partner role that might include physical exhaustion or strains from lifting or repositioning your loved one. All these are things that should be addressed: you need to be in as good shape as possible to continue caring in the best possible way. To do that, you need your mental and physical health. The specialist may be able to connect you with help or resources or both. Your situation is not unique, although aspects of it may be. Confide in them, and you may be able to benefit from their expertise and knowledge. Even if you only discover that they are unable to assist, you will have at least learned that theirs is an avenue that leads nowhere. If the specialist will allow it, doing an audio recording of the discussion and consultation is invaluable. Whenever there are distressing details to discuss, even good note-taking may miss some specifics, subtleties and nuance of what’s said. Having a recording is something you can refer back to to ensure there are no misunderstandings. If you are honest about why you want to record, many specialists will be sympathetic to your reasons, understand the benefits, and agree to it readily. To get a good recording, any recent cell-phone will likely be perfect. Most smart-phones are very well equipped to record sound, but try it out in advance so you know how to do it easily and quickly. Phones are unobtrusive, and will usually be forgotten about once they’re on, but keep in mind that they will need to be in a location where they can pick up what is said clearly, particularly by the clinician. Medical appointments are stressful events in every respect. From the planning, scheduling, preparation, transportation, arrival, waiting, entrance, testing, consultation, results, conclusion, return trip, and potential post-event behavioural issues, there are challenges at every step. You, yourself, hold the key to success: relax, remain calm, and manage your expectations of people and progress. Our loved ones tend to mirror our moods and behaviours, picking up on body language and anxiety. If you get worked up, they will likely start to get agitated or upset as well. And since we are there as their advocate and make such massive efforts to keep them as well as possible, it is counter productive to “lose it” during a critical period around a rarely granted audience with medical royalty. Remind yourself frequently — in advance, during, and afterwards — that your own reactions will impact the outcome. The more relaxed and calm you can be, the better the outcome will be for all involved. This is not easy, particularly if you have little respect for the specialist, lack sleep, are upset by a decline or by challenging behaviours. So let go of anger, resentment and worry as much as possible to make the most of the appointment. That’s what the #1 goal is, to maximize the outcomes of this brief opportunity. So take a few breathes, let go of your frustrations, and embrace this chance to sail swift and sure upon a storm tossed sea to your destination: results. Wrap up the consultation with validation of what has been decided. Use notes from the session to conclude and summarize. Include things such as: what you will do and when; what the doctor will do and when; what to look out for; how to follow up; what side effects to expect if new medications are prescribed; and when the next assessment will be. You deserve to know all these things, and it will also show you have understood, and appreciate the work of the clinician. Ask if they can provide a written summary of the consultation, some do. Afterwards, reflect upon what happened, and how the whole process went. Review the good and bad aspects, and decide how to alter your strategy for your upcoming appointments. With Lewy Body Dementia, discussions with specialists will likely become very commonplace. It is a difficult condition, and maintaing respectful relationships with the “gatekeepers” and the specialists themselves in all interactions will serve you well during LBD’s hair raising roller coaster ride. You can listen to the full article by clicking the red “play button” below. Just ask Earl if he could tell any difference in his movement any time before or after taking his meds.. He replied no. I notice he is stiffer when he first gets up. If he is taking Sinemet (Novocarbo Levodopa), it is possible that the effects have diminished overnight since the morning is likely a long time since his last dose. There is a long/slow release version of that medication that might be worth investigating with your doctor. Please keep in mind, I am not a medical specialist, and only offer this as something to inquire about. Strength! Our appointment went too long. There was another family member in attendance there was no preparation in advance and we both had input. Dispute arose over decreasing the drug dosage on as required and monitored closely. My view is one that the drugs are adequate for now and if anything new develops then changes could be considered then but leave things as they are for now. The doctor in the facility agrees and this is how he manages us. The other wants to urge more assessment and reduction of drugs whenever possible. This created an unpleasant atmosphere. It’s like we needed mediation. > In addition, you are by far closest to the situation, and should be trusted for that. If another person wants to step in for the next year, and evaluate, and then make the recommendation, that seems viable, but not if they’re peripheral. Also, you are an active researcher and actively participate in online forums so I would trust your understanding of the situation. > Mediation might be a viable option — the hospital might have a social worker or conflict resolution specialist that might be able to help. > Hope it can get worked out — family disputes can be so insidious and unpleasant for all. When is mediation a good idea when different family members have strong views on the treatment plan. I don’t have any experience with mediators, per se. A specialist with skills in conflict resolution, rather than a “mediator” might also be able to help, and may be easier to find locally. In a situation like this, a sensitive, objective third-party might work, perhaps a pastor or a social worker, etc. > Outside parties can bring the benefit of a different perspective, and then does not pit two people against each other, and few of us (me more than any) like to give up our views easily. > Hope you get something workable! Strength to you, Timothy Hudson.